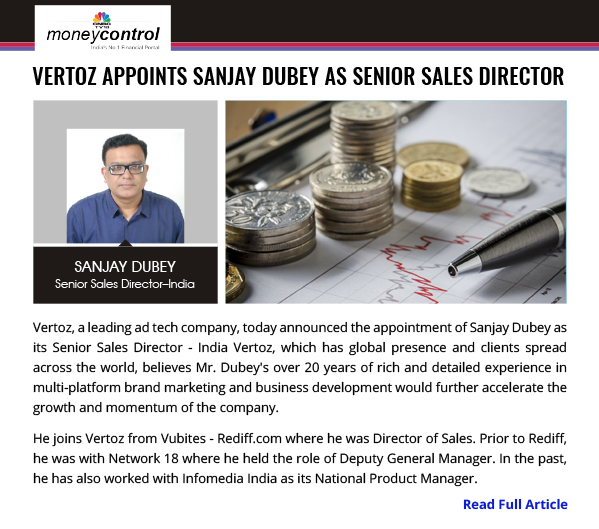 Vertoz is thrilled to announce the appointment of Sanjay Dubey as its Senior Sales Director – India Vertoz. Vertoz has global presence and clients spread across the world, believes Mr. Dubey’s over 20 years of rich and detailed experience in multi-platform brand marketing and business development would further accelerate the growth and momentum of the company. This article covers his past experiences and educational know-how. Vertoz is proud to have someone on the board of Sanjay’s caliber, expertise and perspective joining us. We believe that apart from his role of sales and blending business, Sanjay will help us in managing and scaling operations internationally and help develop the brand and product with global technology to Indian operations. moneycontrol.com is a financial portal born in late 1999, it is a perfect amalgamation of financial markets and the fledgling worldwide web. They radically changed and evolved! moneycontrol.com today gets over 17 million visitors every month across all its platforms-web, mobile and tablets that make it the largest online financial platform in India. Indiantelevision.com was started in the year 2000 by Media and Television analyst Anil Wanvari. It is the first online information and interactive service focusing on the Indian Television and Media business. Their user base has grown over the past 14 years; making it India’s most widely read online Media, Advertising, Marketing & Satellite Television resource. MediAvataar plans to become the most trusted brand of news and intelligence on brands, marketing, media and advertising. They committed to creating content that is stimulating and is critical to decision-makers, consultants, agencies and company executives. They opt-in daily email newsletters, reaches out to an influential audience of media, marketing and business professionals and keep them well-informed with important stories of the day. Vertoz is among the leading programmatic companies, we offer engaging and innovative advertising and monetizing solutions. Our ingenious platform, proprietary technology and advanced capabilities empower a global roster of top advertisers and publishers all under one roof. We want to elevate our technology to make it more user friendly and build strong partnerships with others.